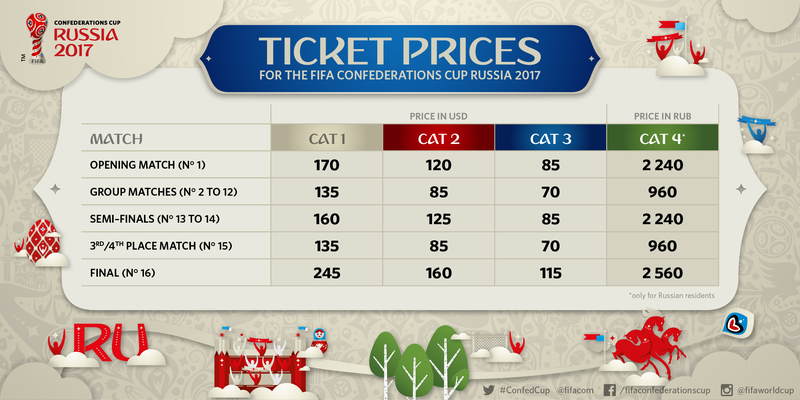 The ticket prices for the FIFA Confederations Cup 2017 and the 2018 FIFA World Cup™ were announced in Moscow following a Local Organising Committee (LOC) board meeting with FIFA participation. As for the South Africa and Brazil FIFA World Cups held in 2010 and 2014, a special category has been reserved for residents of the host country, who will be able to apply for FIFA Confederations Cup Russia group-match tickets starting at RUB 960. At least 100,000 tickets will be available in this specific category 4 for the “Tournament of Champions”, taking place from June 17 – July 1, 2017. The remaining ticket categories are priced from USD $70 – $245. 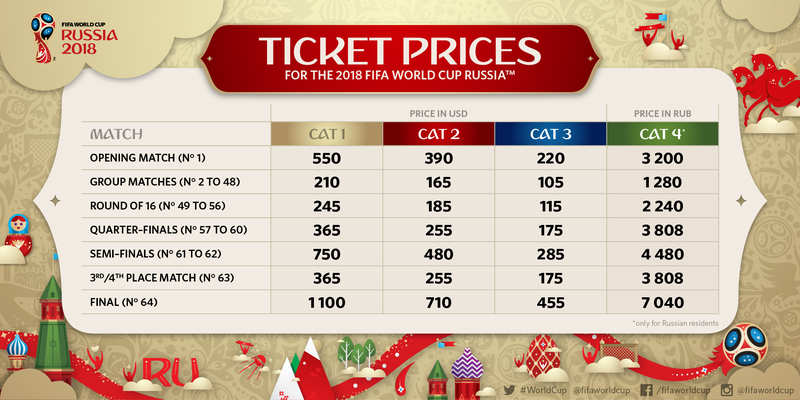 For the 2018 FIFA World Cup, domestic residents will have access to at least 350,000 tickets in category 4, with prices starting from RUB 1,280. Tickets available to all football fans in the remaining categories will be on sale from USD $105 upwards. Ticket sales for fans wishing to attend the FIFA Confederations Cup will begin with a VISA exclusive pre-sales phase running from November 8 – 17, 2016. The first sales phase will then start on December 1, five days after the Official Draw in Kazan. Russia, Germany, Australia, Chile, Mexico and New Zealand have already qualified, while the winners of UEFA EURO 2016 Portugal qualified by winning the tournament. The eighth and final participant will be decided in January at the conclusion of the 2017 CAF Africa Cup of Nations, when the full Russia 2017 match schedule will be known. 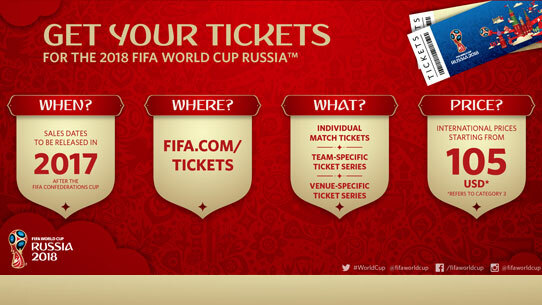 Fans will find all relevant information, including the ticket price list and a FAQ document, on FIFA.com/tickets. To ensure that they do not miss out on anything, fans will also soon be able to sign up for ticketing information in the form of a newsletter.